Sponsored by FansBet: Everton are back again on Saturday; Matt, Connor O, Mike and Sarah are all delighted. The guys are in to reflect on the international break, including another excellent outing for Brazil from Richarlison. Thoughts then turn to the match with Cardiff. 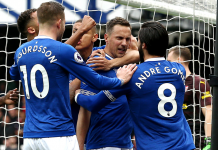 We speak to author Aled Blake about the Bluebirds and ponder who should line up for Everton in defence and in the final third too.